This reissue, first published in 1976, considers the rapid rate of economic growth in Kenya, combined with its apparent political stability, to determine whether or not this is indeed a case of ‘growth without development’ and, if so, where the responsibility for aid lies in this situation. The book concludes that while Kenyan growth has not been to an ideal pattern, accompanied by an increase in inequality, there is little or no reason to believe that living standards have not improved. 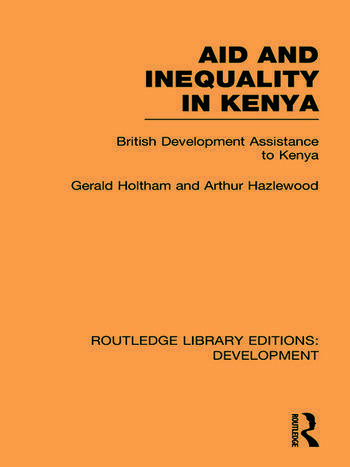 It examines the impact of aid on Kenya’s progress at both the microeconomic and macroeconomic level and provides an institutional study of the impact of aid on Kenyan Government policy formation and administration and a discussion of British aid’s political purposes and influence in Kenya. The authors conclude that some of the effects predicted by the critics of aid are visible, but that the net effect on general living standards has been strongly positive, concluding that the problems constitute a case for improving aid procedures, but not against aid itself.